Super comfort! These socks provide unmatched comfort and performance. 511 Tactical socks have 12 zones of varying compression and fabric blends for increased blood circulation, heat reduction, added stress relief, comfort, and resiliency. These socks perfectly compliment the 6" Low 511 Tactical Boots and other low rise boots that we offer. 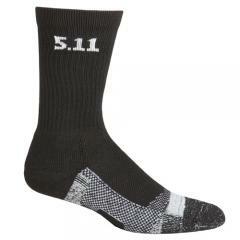 The 511 Tactical socks are an integral part of the Shock Mitigation System®technology.